One of my nieces recently sampled my blog and told me: “sometimes the words seem to flow faster than I can read them“. Another person once told me: “you talk faster than I can think“. Alas, such is the downside of having a racy mind. 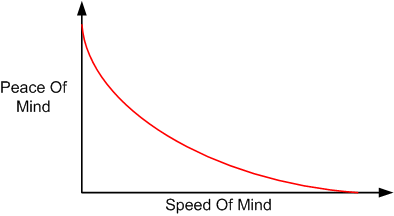 If you believe the curve above, then the question of how to slow down a speedy mind may have occurred to you. Well, there are tried and true temporary solutions to the dilemma: music, drugs, exercise, alcohol, and meditation. If you suffer from a racy mind, what works for you? Do you know of any permanent solutions? What is wrong with a racy mind if you are racing about worthwhile things? If it is racy with worry, then that is a different matter. The best (natural) solution I have found is to be experiencing nature – the beach, the bush etc. Great point about “worthwhile things” Lorraine. Even better point about getting out in nature to put the brakes on. Thanks! Check out “Your Brain at Work” It explains what I call “the wheel is spinning but the hamster is dead” mode of thought. Thanks Kim. I downloaded the free kindle sample and I’ll check it out. I take it that the techniques work for you?